Bhopal: It was probably the label that deterred shoppers in London from grabbing a free bottle of water being distributed one summer afternoon this year. 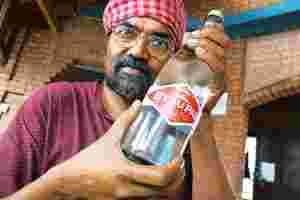 B’eau Pal’s water was deceptively clear even though it came from a slum colony hand pump in Atal Ayub Nagar, Bhopal. Its bold red label told the real story, the fine print that shocked people: “The unique qualities of our water come from 25 years of slow-leaching toxins at the site of the world’s largest industrial accident." 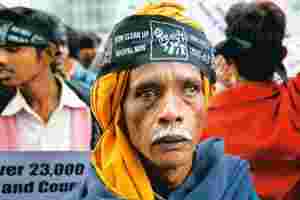 The struggle for justice for the victims of the Bhopal gas tragedy, which happened at the city’s Union Carbide factory, is now no longer limited to sit-in protests, black flags or burning effigies on the streets of New Delhi or Bhopal. It’s now moving out of Indian shores. B’eau Pal is the wacky product of two anti-globalization activists’ imagination. Performance artists from the UK—Mike Bonanno and Andy Bichlbaum, popularly known as The Yes Men—launched B’eau Pal to highlight what they said was the continued refusal of Dow Chemical Co., which bought Union Carbide Corp. in 2001, to take responsibility for the disaster. At least 25,000 people died as a result of the leak on the night of 3 December 1984. Dow has always maintained that it has nothing to do with the accident and that the defunct Union Carbide factory in Bhopal is now the property of the Indian government. The company said in an emailed statement: “Although Dow never owned nor operated the plant, we—along with the rest of industry—have learned from this tragic event, and we have tried to do all we can to assure that similar incidents never happen again." The statement also pointed out that “the former Bhopal plant was owned and operated by Union Carbide India Ltd, an Indian company with shared ownership by Union Carbide Corp., the Indian government and private investors. Union Carbide sold its shares in UCIL in 1994, and UCIL was renamed Eveready Industries India Ltd, which remains a significant Indian company today." Responses such as those haven’t satisfied activists such as Bonanno and Bichlbaum. Their satire has extended to a movie, The Yes Men Fix the World (TYMFTW), and will soon extend to a comic strip. Released in the US last month, TYMFTW also had a select screening in Bhopal. The film premiered in the UK on 11 August, soon after the B’eau Pal launch in London, and won an award at the Berlin Film Festival. “B’eau Pal communicated the tragic effects of the gas leak 25 years ago that continues to wreak havoc in areas close to the disaster site in Bhopal, and it symbolized everything bad that’s happening in the world right now. It’s essentially about putting profit over everything else," Bonanno said over the telephone from London. The launch also coincided with the release of a report by the Sambhavna Clinic, a charitable organization working for relief and rehabilitation of at least 100,000 survivors of the tragedy. The report showed that the local groundwater, vegetables and breast milk in Bhopal are contaminated by toxic quantities of nickel, chromium, mercury, lead and other volatile organic substances. The report added that several babies in nearby localities were born with serious medical problems. When Sathyu Sarangi of Sambhavna planned a Scotland trip earlier this year, Bonanno, along with the Bhopal Medical Appeal, another non-governmental organization based in London, got in touch with him for the spoof. Bonanno said they even took B’eau Pal to the Dow office in London. Sarangi, a trained metallurgical engineer, quit his corporate job in the US to support the Bhopal cause. Kennedy and Monk, a London-based firm, designed the B’eau Pal’s label free of cost. “We want to keep it alive as an issue. Satire and serious agitation are two sides of the same coin; they don’t exist without each other. In Bhopal, humour probably hasn’t been appropriate for many years, but it is now more relevant than ever before," Bonanno said. Five years ago, Bonnano impersonated an executive of Dow Chemical live on BBC World Television to announce that the company was going to clean up the disaster site in Bhopal. The hoax had then brought Dow’s shares down by $2 billion (Rs9,320 crore now) until it was identified, and now, features in TYMFTW. The Yes Men’s other famed hoaxes include a collaboratively produced fake New York Times edition announcing the end of the Iraq war, a phoney George W. Bush website and the false announcement of the World Trade Organization’s dissolution in order to shift focus to helping the poor. The stir has brought support and attention for The Yes Men and for Bhopal. However, the film has not been released yet in India. In the disaster-affected colonies of Bhopal, where Sarangi’s organization carries out relief and rehabilitation work, almost no one knows about the latest addition. Critics also question the long-term impact of such forms of protest. Television commentators in the West denounced Bonanno and Bichlbaum’s stunt (of impersonating a Dow executive) as a cruel joke that gave the victims of the disaster false hope. Bonanno, who served in corporate America, like Bichlbaum, before settling with a teaching job at the Rensselaer Polytechnic Institute in New York, disagreed. “When we did this, Dow’s shares came down. We got some 600 articles on Bhopal in the US press, which wouldn’t have happened without the spoof. We may not protest but what we have been doing brings the disaster back in public discourse." This is the fourth part of a series. Tomorrow: The current environmental and medical situation.